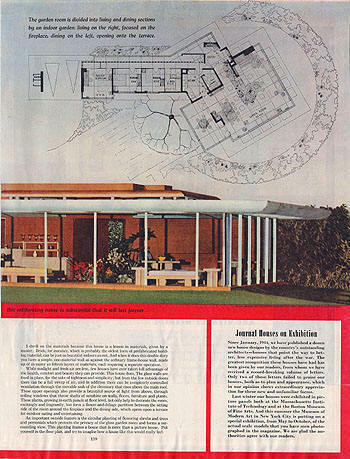 Designed by Frank Lloyd Wright in 1944-1945 for the "Ladies Home Journal", the Opus 497 "Glass House" Model and Plan was published in the June 1945 issue. 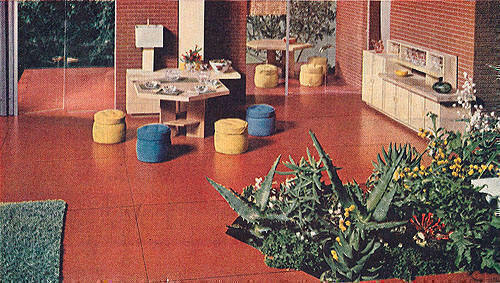 At first glance this image looks like a detail of Broadacre City, but upon further study, it was discovered to be a detail of the model built for the Ladies Home Journal in 1945. 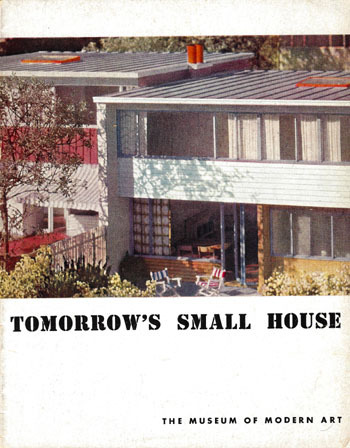 In January 1944, the LHJ began publishing new house designs by the country�s outstanding architects, "houses that point the way to better, less expensive living after the war". This caught the attention of the Department of Architecture and Industrial Design at the Museum of Modern Art. Seven of the models created for the LHJ, were the focus for the exhibition "Tomorrow�s Small House: Models and Plans" held at MOMA from May 29 - September 30, 1945. Also included in the exhibition was a model of a row-house and a neighborhood development. Originally created to enable color photographs to be taken of the models for the magazine, the models were so complete and detailed they made excellent displays. 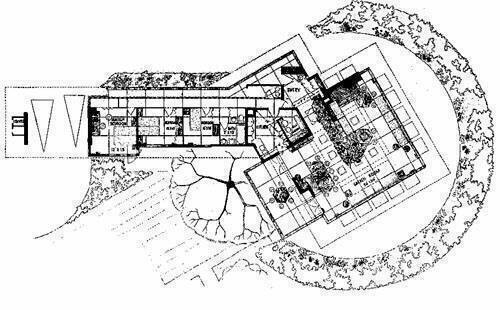 A prominent feature of this home was the large 30' x 30' Living Room, or "Garden Room" as Wright called it. Set at a 45 degree angle to the rest of the home, it encompassed the Living Room, Dining Room and Fireplace. Central to the Living Room was the indoor garden which extended down a hall way toward the Entrance. It was lit from above by a series of skylights. A portion of the Living Room ceiling was also raised, allowing clerestory windows to add additional light to the indoor garden. The Bedroom wing, set at a 45 degree angle off the Living Room included the Kitchen and Utility Room, Bathroom, two Bedrooms and at the far end, the Master Bedroom. A full set of working plans were prepared, and according to Pfeiffer, the Journal completed the model. Opus: Any artistic work, especially one on a large scale. Wright's estimate as to the number of projects he had created to that point. In 1942 Lowell Walter (1945 - S.284) contacted Frank Lloyd Wright. 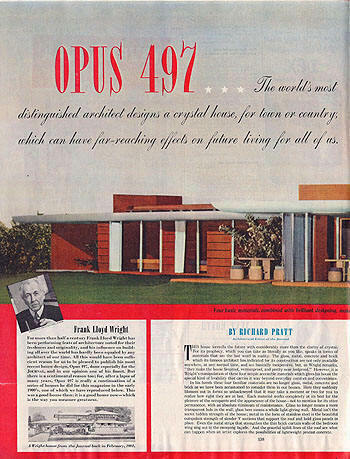 The design was completed in 1945 utilizing the original Opus 497 concept. Construction began in 1948 and the Walter Residence was completed in 1950. Opus 497... The world's most distinguished architect designs a crystal house, for town and country, which can have far-reaching effects on future living for all of us. Four basic materials combined with brilliant designing, make this exhilarating house so substantial that it will last forever. Courtesy of the "Ladies Home Journal", June 1945, page 138-139. Accent of Living. By Henrietta Murdock. The intriguing room... is the everyday family room of our latest postwar house... floor-to-ceiling windows, with the drama of all outdoors for a background. This new kind of room has been made to fit the family and its everyday family activities, so you can play, read, eat, talk and study all in the same big area. ...the architect has suggested furniture that can be moved easily and assembled in spots about the room as needed for any particular purpose. Courtesy of the "Ladies Home Journal", June 1945, page 141. The Garden room is divided into living and dining sections by an indoor garden: living on the right, focused on the fireplace: dining on the left, opening onto the terrace. Four basic materials combined with brilliant designing, make this exhilarating house so substantial that it will last forever. Detail of the Garden Room. Dining Room is on the left, Living room and Fireplace are on the right. The room gives you a preview of the kind of interior you will be seeing more of in the future. Casual, efficient, modern as your new car, it fits the family, accommodates itself to home activities and occupations. 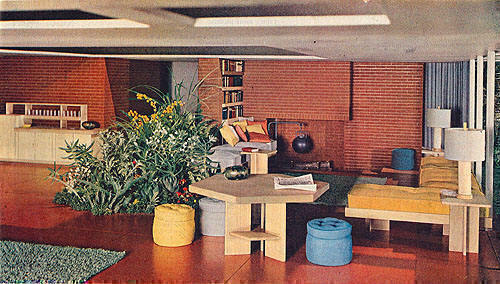 Notice the dropped fireplace, the indoor garden and the clear spectrum colors used in the scheme. Pictured is the dining end of the big modern room. Glass doors open onto the terrace for summer dining. As with the entire room, the emphasis is on function and comfort rather than on decoration. Pages, text and images are courtesy of the "Ladies Home Journal", June 1945, pages 138-139, 141. Opus 497 "Glass House" Model. 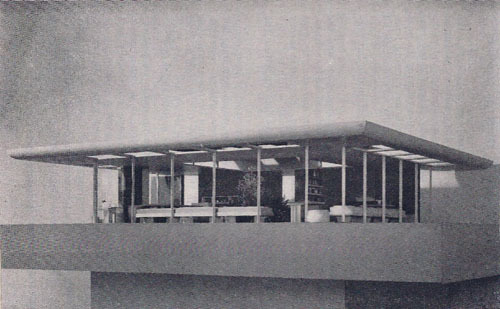 Designed by Frank Lloyd Wright in 1944-45 for the "Ladies Home Journal", the Opus 497 "Glass House" Model and Plan was published in the June 1945 issue. 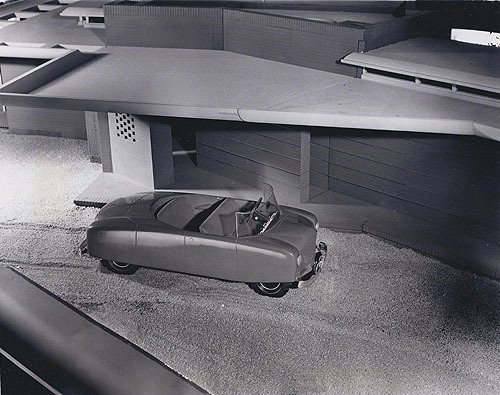 At first glance this image looks like a detail of Broadacre City, but upon further study, it was discovered to be a detail of the model built for the Ladies Home Journal in 1945. 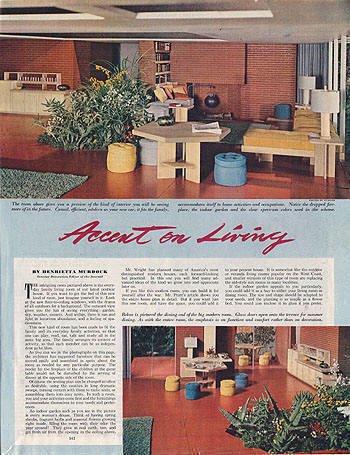 In January 1944, the LHJ began publishing new house designs by the country�s outstanding architects, "houses that point the way to better, less expensive living after the war". This caught the attention of the Department of Architecture and Industrial Design at the Museum of Modern Art. Seven of the models created for the LHJ, were the focus for the exhibition "Tomorrow�s Small House: Models and Plans" held at MOMA from May 29 - September 30, 1945. Also included in the exhibition was a model of a row-house and a neighborhood development. Originally created to enable color photographs to be taken of the models for the magazine, the models were so complete and detailed they made excellent displays. Detail of the entrance to the Opus 497 Model. 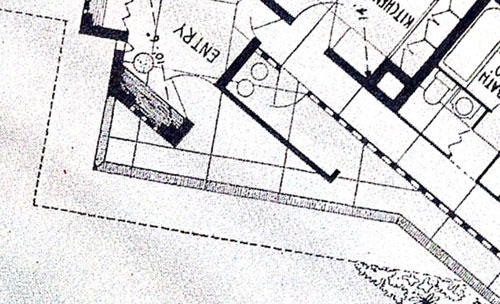 Caption pasted to verso: Detail: Wright House. Overhang at the entrance to the house designed by Frank Lloyd Wright, would protect persons to and from car in driveway. Detail from floor plan showing entrance. Floor plan courtesy of the "Ladies Home Journal". Excerpts published in Pencil Points, September 1945. Courtesy of "Pencil Points", September 1945. 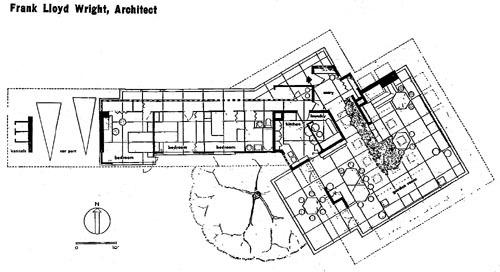 Floor plan courtesy of "Pencil Points", September 1945. 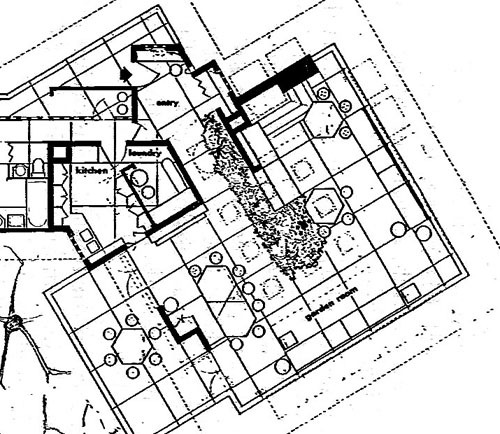 Detail of floor plan courtesy of "Pencil Points", September 1945.